Whether moving to or from Toronto, it pays to hire a good mover to handle your relocation. Toronto movers offer a wide variety of moving packages to suit all types of moves and budget. The trick is to compare multiple moving companies, check their moving rates, and find the best deal. You can compare movers easily and at no cost by using our free moving quotes. Why Compare Movers in Toronto? There are many moving companies in Toronto. While many of them share good qualities such as experience, reliability, and good customer service, they offer different prices. For the same price, you can find the best moving company that gives you the best value for your money. These things matter a lot. If you are moving locally with a lot of household goods and a mover gives you a smaller truck for a cheaper rate, you may end up paying much more because of multiple trips. Also, some moving companies may have a slightly higher rate but they provide comprehensive insurance with a full-service move. This means coverage is much more than the $0.60 per pound included in basic insurance. Need to find the best Toronto moving company? If you are looking for the best moving company in Toronto, you can use our platform to get quotes in an instant. Our moving partners will send you competitive quotes for your type of move. With 1 request form, you will receive up to 5 moving estimates from 5 different moving companies so you can get the best price. Using our platform lets you save time and money by matching moving companies for your move on your own terms. Aside from comparing prices in order to get the lowest possible quote for the same service, you also get other perks. We don’t just let anybody submit a moving quote. We verify our moving partners to make sure you do business only with legitimate companies. Moving companies that submit moving bids are experienced. You are also assured that your goods are in safe hands. You have complete freedom to choose your mover. You can ask moving companies for more details, negotiate your price, and pick only a moving company you are satisfied with. If you are not satisfied, you also have the freedom to walk away. When moving, time and money are things you want to save on. We aim to simplify your search for the right moving company and help you choose a mover with the best price. Not all moves are the same. Your type of move will dictate the price of your move. You can get quotes for long distance moving to Toronto or local moving within the Greater Toronto Area. You can also get moving quotes for an international relocation or moving from Toronto to the USA. When moving within Toronto, a moving company will charge you hourly rates. These hourly rates depend on the number of movers and the size of truck. So don’t be confused when one mover charges $80 per hour while another charges $110 per hour. Check the number of movers and the size of truck provided in the quote. Long distance moves are generally more than 150 kilometers but that can vary among moving companies. If you are moving from one city to another, such as from Ottawa to Toronto, that would be considered a long distance move. Long distance moving rates are calculated based on distance and weight of your cargo. Companies provide a moving estimate after an in-home inventory. Sometimes, you need to move a specialty item that needs professional handling. If you have a baby grand piano or a pool table, it is best to leave it to the experts. There are many GTA moving companies that specialize in piano moving or pool table moving at very reasonable rates. In Canada, many people make cross-border moves to the USA. This is considered an international move and passes through customs and immigration. Not all companies are qualified to handle cross-border moves between Canada and the US. The weight of your cargo and distance of travel are also used to calculate your moving cost. There are many moving companies offering International relocation such as from Canada to the UK and many other destinations in the world. In choosing your moving company, it is best to consider your type of relocation and to go with a company specializing in your type of move. You can get a lot of tips and moving advice from our Long Distance Moving Guide in Canada and the US. There are many GTA moving companies who also specialize in moves from Toronto to Vancouver, with regular runs that can be cheaper for you. If you are moving from Toronto to a US city, make sure to hire an international relocation company. Submit a request for free online moving quotes today to take your pick from the best moving companies in the Greater Toronto Area. Hundreds of new arrivals in Toronto make it a popular moving destination in Canada. In fact, it is one of 3 top moving choices for expats and immigrants relocating to the country from all over the world. More than 50% of this city’s population are born out of Canada, making it one of the most diverse cities in the world. Toronto offers the best employment opportunities for expats and also attracts a huge number of foreign students. Ethnically and culturally diverse, it is a city with so much to offer. But it can also be a very expensive city to live in. Living outside Toronto means lower housing costs and a more suburban lifestyle. Toronto has a regional public transport system with suburban trains linked together to provide a variety of options for commuters. Our network has professional moving companies serving all these areas in the GTA. See some of the Top Moving Companies in Toronto and how to save on moving costs. Moving companies are not all the same. Some are superstars with multiple awards and badges. Their reputation is also greatly enhanced by memberships in prestigious moving organizations in Canada and the world. The Canadian Association of Movers (CAM) is a highly prestigious national moving organization in Canada that aims to promote and maintain ethical standards in the moving industry. The American Storage and Moving Association (AMSA) is a national and well-respected moving organization in the United States. It is the leader in certifying professional movers in the USA to ensure moving companies comply with government regulations and offer quality moving services. The International Association of Movers (IAM) has more than 2,000 members from 170 countries, including moving, forwarding, shipping and logistics providers. Their aim is to promote strength, ethics, and accountability among its member companies. Whether a mover is based in Canada or the USA, it can be verified with the BBB. Accredited companies with the BBB indicate a company’s adherence to ethical business practices and are given ratings based on their compliance and performance. Movers will proudly display their BBB rating – A+, A, B for transparency to customers. When in doubt, customers can always verify a moving company’s standing with the BBB. You can find many moving review sites online such as Yelp, Google Reviews, My Moving Reviews, or Homestars. Movers are awarded stars and help customers check on moving companies from customer feedback. It pays to see what stars your moving company has as they indicate the quality of your mover. When in doubt, you can check a moving company’s reputation from the above-mentioned authorities in moving. We offer you free moving quotes to compare the best Toronto moving companies for your move. Take 2 minutes to fill-out 1 form and get 5 moving quotes from movers near you. Your household goods will be handled by your moving company. Thus, you must ensure that your belongings are safe in the hands of your movers. Our moving partners are legitimate and experienced moving companies that are reliable in household relocation in and around Toronto. Compare free moving quotes today and save time and money on your move. 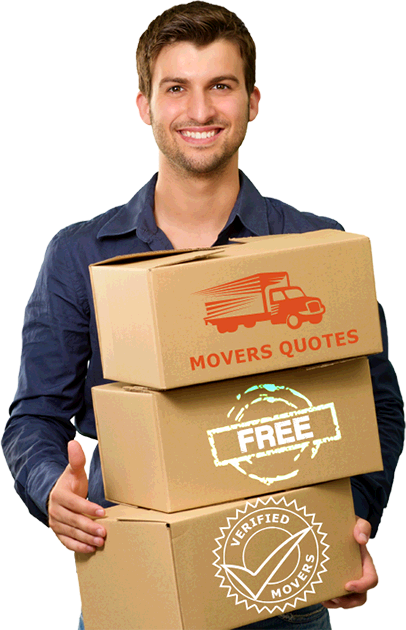 Get Quotes from 5 Movers!